yet still clawed their way into the playoffs, thanks to the biggest September comeback in baseball history. They enter the 2012 season with no significant player losses, the deepest starting rotation in the game, and also the best defense. Normally when you’re a run-prevention juggernaut with further upside (thanks to Rookie of the Year front-runner Matt Moore) you don’t sweat that stuff. 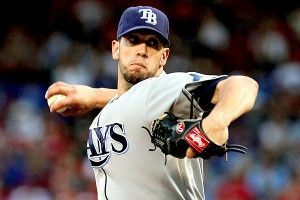 But in the Rays’ case, they’re staring down the loaded Yankees and Red Sox, knowing that in a close race, their rivals will be more likely to make a high-impact deadline deal than they will. So they’ll need to solve at least some of their offensive questions. Can new DH Luke Scott stay healthy and recapture his 2010 form (.387 wOBA)? Can Carlos Pena and Matt Joyce hit lefties, and can Sean Rodriguez hit righties (and if not, how aggressive will the Rays be about platooning)? Can Jose Molina hit anyone? Some of these variables will need to go Tampa Bay’s way if they’re to overcome their AL East foes, not to mention the loser of the Rangers/Angels death match in the West. Picking up Jeff Keppinger allows the Rays to shift Zobrist to right field or first base against lefties, giving Joyce or Pena days off against tough left-handers. The Rays would benefit from carrying Brandon Guyer as a fifth outfielder for more right-handed sock, but they might prefer to give him more reps at Triple-A instead. maybe even as soon as this year. Other than Pena and Molina, there’s a lot of potential variance in this lineup, much of it on the good side. The Rays’ second five: Wade Davis (or Jeff Niemann, depending on who loses the SP5 battle), Chris Archer, and the three Alexes, Cobb, Torres, and Colome. That could very well be better than the Orioles’ actual rotation. Tampa Bay’s brass talks often about their quest for depth, how they leverage it to beat top-heavy rival teams with more star power. But there may be an opportunity here in July, if the Rays need a veteran for the stretch run and are willing to part with some of that excess pitching. The bullpen’s also as well staffed as any in franchise history, with capable young arms like Jake McGee, Brandon Gomes, and Josh Lueke vying for spots behind solid late-inning duo Kyle Farnsworth and Joel Peralta. All this before we even touch a starting staff that features two pitchers capable of winning this year’s Cy Young in Shields and Price, last year’s Rookie of the Year in Hellickson, and a flame-throwing lefty in Moore who could have a better career than all of them by the time he’s done. Moore. “He’s above me where I was at the same time period. His changeup and his breaking ball, his slurve at 84, 85, 86. His fastball and his changeup are so good he probably doesn’t need that breaking ball. The Rays make the playoffs for the fourth time in five years, making their initial worst-to-first burst look less and less like a miracle and more like a sustainable triumph of process over results. Aside from an abundance of pitching talent and one of the game’s best all-around players in Longoria, the Rays can count on a few extra wins a year from the litany of unorthodox strategies Joe Maddon and his staff deploy. They’ll shift three infielders to one side, against both left- and right-handed hitters. They’ll load the lineup with left-handed hitters against lefty pitching, and righties against a righty, if they spot a pitcher with, say, a killer changeup. The Rays run more aggressively than virtually anyone else, yet get caught less often than you’d expect. They keep their players healthier than nearly any other team. In short, they’ve mastered all the little edges needed to elevate them from intriguing sleepers to legitimate World Series contenders. The lineup springs too many holes, and a good Rays team proves not quite good enough to crack the postseason, even with the extra wild card in play. Don’t bet on it, though.